Should Supermarkets Be Worried About Amazon Dash? Amazon just introduced Dash, a home shopping wand that synchronizes with AmazonFresh. Should supermarkets be worried? 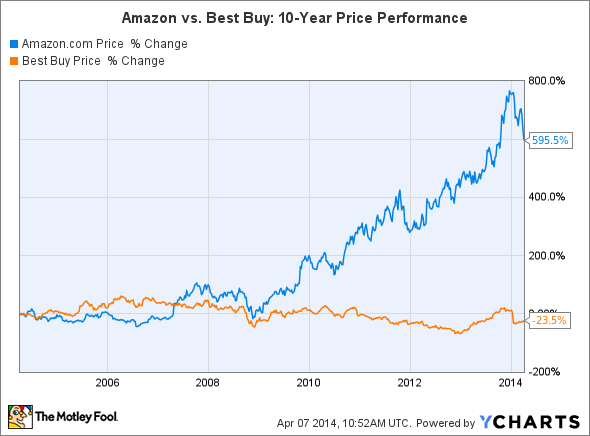 Amazon (NASDAQ:AMZN) has been busy lately. Shortly after unveiling its new set-top box, the Fire TV, Amazon revealed Dash, a handheld device that allows customers to order groceries and household goods from home. Dash is a wand-like device that allows users to scan barcodes or speak the names of goods into a microphone to log orders to an AmazonFresh grocery delivery account. The Dash is six inches long, an inch wide, and uses a Wi-Fi connection to synchronize the orders to the website. AmazonFresh is an experimental effort that currently offers next-day delivery of fresh groceries and other goods to customers in San Francisco, Seattle, and Los Angeles. The Dash will initially be offered to a limited number of trial customers in Los Angeles and San Francisco who are signed up for Amazon's Prime Fresh unlimited delivery program, which costs $299 per year. However, if Amazon starts rolling out the Dash across the country, could it hurt grocers as much as it hurt big box retailers like Best Buy (NYSE:BBY) and Wal-Mart (NYSE:WMT) over the past decade? Investors who follow big box retailers are familiar with the concept of "show rooming," where a customer browses a brick-and-mortar store then orders the product online from a cheaper e-commerce source like Amazon or eBay (NASDAQ: EBAY). Barcode scanners on smartphones made showrooming even easier, forcing Best Buy and Wal-Mart to sacrifice margins and match online prices. Best Buy and Wal-Mart believed that the instant gratification of a physical purchase would generate higher sales volume to offset the lower margins on each product sold. Source: Best Buy annual reports. Would major supermarkets like Kroger (NYSE:KR) suffer the same fate as Best Buy if Amazon rolls out AmazonFresh and Dash nationwide? Kroger's gross margins, which are considered robust by industry standards, have steadily declined over the past four years. That contraction caused Kroger to acquire upscale grocery chain Harris Teeter for $2.5 billion in January to sell its higher margin products. Now imagine people scanning prices of cereal and carrots with smartphones, and Amazon's plan starts coming together. Yet Amazon Dash goes one step further, skipping the trip to the grocery store altogether and turning the customer's home into a showroom. If you need anything, just scan or say it with Dash, and Amazon delivers it to your home the very next day. Is Amazon Prime Fresh competitively priced against grocers? Amazon's $299 annual fee for Prime Fresh merges the benefits of Prime's $99 annual membership (free two-day delivery on select items, the free Kindle e-book lending library, and unlimited video streaming) with free same-day and early morning delivery on grocery orders over $35. Therefore, the plan only costs $200 more per year for current Prime members. Let's do the math and compare Amazon Prime Fresh to the fees generally associated with shopping at regular supermarkets. Those figures would fluctuate a lot depending on a car's fuel efficiency and gas prices, but they explain why Amazon is limiting its delivery area to three metropolitan areas -- expanding its presence to rural areas is too costly. The second consideration would be the prices of the grocery items. The prices of fresh produce are hard to compare due to seasonal and regional considerations, but the prices of Amazon's packaged goods are very competitively priced. Prices on AmazonFresh. Source: Amazon. A 6-ounce can of Blue Diamond almonds costs $2.99 on AmazonFresh, compared to $34.95 for a dozen 6-ounce cans ($2.91 each) on Blue Diamond's website. A 20-ounce can of Sun Maid Raisins costs $3.49 on AmazonFresh, compared to $3.29 on Sun Maid's website. Those slightly lower prices, however, are easily offset by Amazon Prime Fresh's unlimited year-round shipping. Will the Amazon ecosystem automate everything? When we consider that Prime has over 20 million members, and Kindle Fire tablets and Fire TV set-top boxes keep customers locked into the Amazon ecosystem, AmazonFresh is in a "prime" position to disrupt the market with online grocery shopping with Dash. However, that disruption won't happen overnight. Amazon won't be able to reach rural markets -- the people who would benefit the most from an automated grocery delivery system -- until it finds a way to balance the fuel and labor costs associated with next-day delivery. Google (NASDAQ: GOOG)(NASDAQ: GOOGL) has been experimenting with a similar concept known as Google Shopping Express, but the service remains tethered to urban areas just like Amazon Fresh. Both Amazon and Google have tested delivery drones to solve the problem, but considering that the drones can't carry cargo heavier than five pounds or travel over 10 miles, they aren't practical for most grocery deliveries. However, Kroger and Wal-Mart should notice that Amazon has considerably accelerated its AmazonFresh rollout. The service was originally available in Seattle in 2007, but it was expanded to both San Francisco and Los Angeles in 2013. This strongly indicates that it could reach additional major urban areas much sooner than expected. Just as Amazon revolutionized how we shop online, read books, watch videos, and download video games, it could soon change how we restock our fridges and pantries. If that happens, grocery stores in urban and suburban areas could be hit by a devastating drop in comparable store sales.